A review of Rebecca Solnit’s Field Guide to Getting Lost. Solnit’s concern with consciousness and identity opens a broad terrain. A writer could go in many different directions in describing the processes of losing the self and then finding it again. That’s precisely what Solnit does. Her style is tangential, associative. She jumps from analyzing the movie Vertigo and its love affair with the San Francisco Bay Area, where she lives, to discussing a love affair of her own in the Mojave desert, to recounting the story of the Spanish conquistador Cabeza de Vaca. This explorer, after being hopelessly lost in the American interior, spent years wandering in search of his countrymen, only to discover, once he found them, that he had more in common with the native peoples he had come to admire than with their colonizers. Solnit is idiosyncratic and learned. Of her young adulthood, she writes, “Punk rock had burst into my life with the force of revelation, though I cannot now call the revelation much more than a tempo and an insurrectionary intensity that matched the explosive pressure in my psyche,” and then she unexpectedly draws into her punk world Keats, Nabokov, Borges and the Road Warrior. You can only guess whether she will next plumb meaning from a friend’s off-handed remark or a passage out of Thoreau. Amid her free-form meandering, you quickly detect a sense of control. The guiding intelligence of Solnit’s personal essays recalls Annie Dillard, while her naturalist’s affection for the Southwestern desert and the Great Salt Lake are reminiscent of Terry Tempest Williams. Then again, Solnit herself is no neophyte. Prior to Field Guide, she published eight books, including Savage Dreams, a work rooted in her anti-nuclear activism at the Nevada Test Site, and River of Shadows, a book about photographer Eadweard Muybridge that won the Nation Book Critics Circle Award. 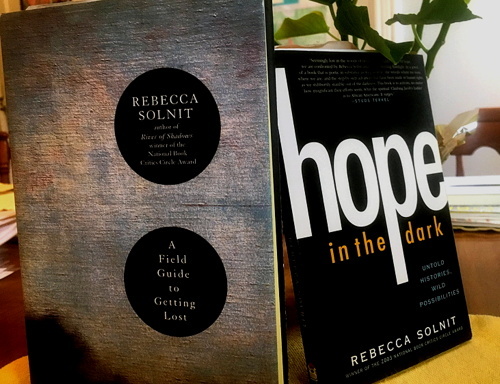 Solnit’s profile as a political writer has risen considerably over the past couple years, in part due to Tom Engelhardt, whose TomDispatch.com distributes not only his own essays focusing on the U.S. occupation of Iraq, but also work by authors he has befriended, Solnit prominent among them. Out of her essays for TomDispatch came her eighth book, Hope in the Dark, a primer on activism in foreboding times. With her new Field Guide, Solnit earns our confidence with the strength of her personal reflections and cultural insights. She tells us that our word “lost” comes from the Old Norse los, “meaning the disbanding of an army, and this origin suggests soldiers falling out of formation to go home, a truce with the wide world.” She adds: “I worry now that many people never disband their armies, never go beyond what they know.” It is, no doubt, a warranted fear. And it should make us hope that Solnit finds many pupils for her tutelage in the unknown, which proves both beautiful and true.